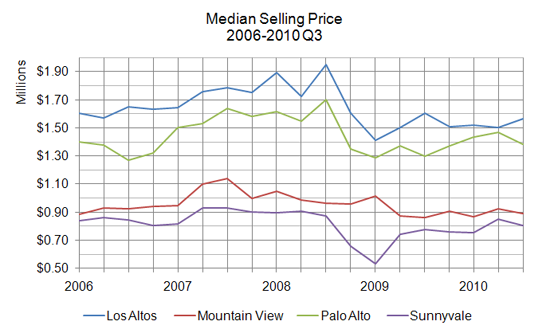 The high home prices of Los Altos influenced how it reacted to the 2007 bust, mainly a hold off of purchasing (only 38 homes sold in the fourth quarter of 2008) and a depreciation of the median sales price. This past quarter, Los Altos is still struggling in its sales price to list price ratio, a result of many buyers unwilling to pay the full listing price. But this shouldn't overshadow that this quarter the city put up the highest median sales price for the year. And compared to the same period in 2009, the median sales price is up 7% and days on market fell 8%, both good signs. We can only anticipate what 2011 will be for real estate, but if Los Altos is any indication, higher-priced markets could be shaking off their frost a little sooner than the past few years. Mountain View has been an example of what many buyers and sellers would hope to see in their local market after the housing bust. The city fell, but not as hard as its neighbors, and recovered immediately into a slow rise that continued throughout 2010. Its weak points this quarter were in average days on market (still better compared to 2009, with 61 days) and a sales price to list price ratio that favors buyers. The median price rose in the fourth quarter, and aligns with the more popular spring and summer months, including besting the same period in 2009 by more than $10,000. One thing to consider when looking at data from Los Altos is that its population of around 30,000 is less than half of the next smallest city in our quarterly comparison. But, on the other hand, the median price is the highest at $1,565,000 -- 13% higher than Palo Alto and almost double either Sunnyvale or Mountain View. 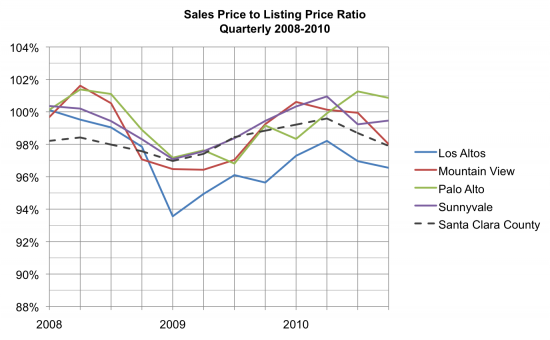 In the third quarter of 2010, the median price bumped up 4.3% from last quarter and is equivalent to 2006 levels. Another positive sign for Los Altos is that average days on market is in the 40s range, a significant improvement from the third quarter last year, where it was hanging out at 67 days. The last item of note for Los Altos is the sales price to listing price ratio has fallen this quarter, 96.96% from 98.21% last quarter. Since 2008, Los Altos has been a buyer's market, while our three other comparison cities have been trending towards a seller's market. Buyers aren't necessarily hesitant but we are seeing a lot of price adjustments in the area. Part of the advantages of Silicon Valley is that the housing market ride for the past few years has been less bumpy than what the nation has experienced. A good example of this calm is in the city Mountain View. Even examined against our other comparison cities, Mountain View has been the most stable, especially in regard to the median sales price. It bumped up to $1,148,440 during the boon in 2007, but unlike everybody else in 2009, it bumped up instead of sliding. Since then the city median has floated at $900,000 for single-family homes. 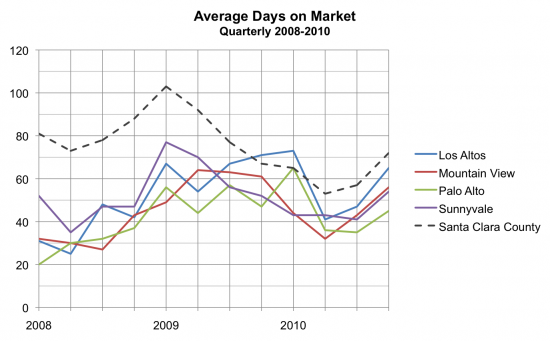 Average days on market bumped up and closed sales fell compared to last quarter, but some of that is due to market cycles. The sales price to listing price ratio is at a healthy 99.94%, meaning a fair market for both buyers and sellers. 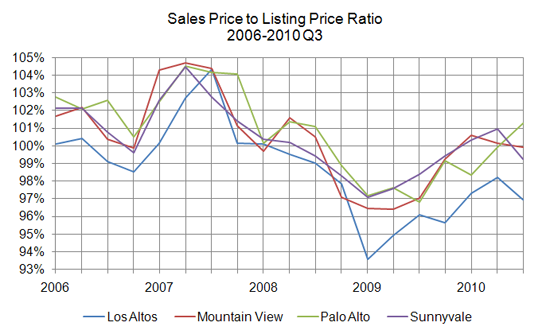 Part of the stability in Mountain View is due to the reasonable prices compared to Los Altos and Palo Alto. There will always be buyer demand at just under a million, especially since it shares the benefits of being a neighbor to prestigious cities, has good schools, and an ideal location in the Silicon Valley.